Natural range Pacific coastal area of Kamchatka, Alaska, to Baja California. Habitat Well oxygenated clear freshwater. Usually fast stream, and sometimes lakes and dams. Some population anadromous. Route Deliberate: For aquaculture and sports fishing. Impact Actually: Competition with native salmoid fishes. 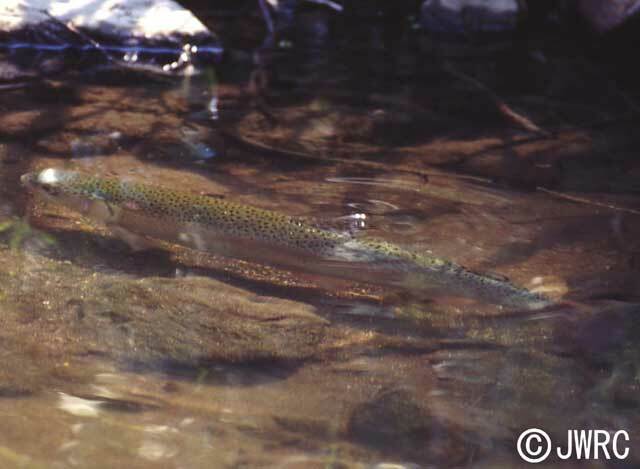 Eggs of salmoid fishes (such as white spotted char) are laid waste due to late oviposition of rainbow trout. In foreign country, competition and hybridization with other salmoid fishes and predation on crustaceans. Affected organism: Native salmoid fishes, freshwater insects and crustaceans, etc. Regulation in Japan Introduction of this species is prohibited in Shiga and Saga Pref. Capture of this species is regulated by several local governments. Introduced range in other countries Worldwide, Korean Peninsula, Pakistan, Sri Lanka, W Asia, C Asia, Europe, E & S Africa, Madagascar, Australia, New Zealand, Papua New Guinea, Canada, C & S America, Dominica, Hawaii, Azores Is., Madeira Is., Kerguelen Is., Reunion, etc. Froese & Pauly (eds) (2009) FishBase (Accessed on 2010-12-13) http://www.fishbase.org/.